Lately, my span has been pretty short; maybe the product of an overflowing plate, perhaps the consumption of too many interests. Regardless of the cause, this piano piece has stared at me with those sneaky sharps and flats for weeks now, begging my attention while I turn the other cheek, resentful of the guilt its existence keys up. As I wonder why this song, after a few years of piano lessons, is causing me such dissonance, I realize this: because it’s not coming easy to me so I’m not paying it attention. After always following my piano instructor’s recommendations on the sequence of progressions I should learn to methodically advance my skill-set, I requested a hike off the beat and measure, as I had fallen in love with an album from an independent film called “The Piano.” Moved by British composer Michael Nyman’s haunting minors and expressionism, I wanted to give it a try myself. Deceived by his minimalist style and propulsive repetition, I might have underestimated its difficulty. Enter “La canduer,” a 19th century composition by Johann Friedrich Franz Burgmüller, whose name pronunciation came to me as easily as his music did. 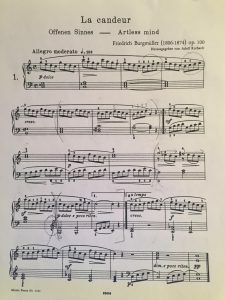 “Artless mind” – my piano teacher felt this would be step one of a logical bridge from where I’m currently at to where I’ll need to be for Nyman, yet the title disagreed and told the truth, all at once. While walking past it this evening without any intention for attention, I made myself anyway. I sat down, read my teacher’s instructions on how to systematically digest it, and measure by measure I referred the repetition to retention. Within a focused hour, I could hang with the rest of her seven year old students, and the addictive and satisfying sensation of accomplishment sank in. Even without my piano lesson this week, I learned a few others. If you ask for it, be willing to invest in it. If you’re not, reassess whether it really matters to you. If it does, remind yourself why and build it in. And remember that before you were good, you weren’t. Before you were great, you were good. And before the end of the day, it might be worth your attention.